Workers allege serious safety issues, and retaliation for exposing them. An update with comment from Olivet appears below. At 5 am PST today, non-union workers moving Walmart goods at a California warehouse plan to launch a two-day surprise strike in protest of alleged retaliation for exposing safety risks. Organizers expect at least thirty of the warehouse’s 200-some employees to join the work stoppage, the latest in a wave of Walmart supply chain strikes. Following the May filing of the complaint—which included fifteen photos taken by workers—activists allege that Olivet responded with an intimidation campaign. “They’re watching us all the time,” said Baizabal. Workers charge that management has installed twenty-nine surveillance cameras and begun following activist-workers. They allege that the company has retaliated by cutting employees’ hours and implied that they could lose their jobs. And they say Olivet instituted new rules restricting health and safety discussions, and regular meetings to discourage organizing. Today’s strike follows work stoppages by workers at two other Walmart-contracted warehouses last fall—one at another Mira Loma facility and the other at the Walmart distribution center in Elwood, Illinois, which organizers say handles the majority of Walmart imports to the United States. It comes as Walmart faces a new high-profile challenge to its business model—a “Large Retailer Accountability Act” passed by the Washington, DC, City Council and currently awaiting a signature or veto by Mayor Vince Gray. The Mira Loma warehouse strike also follows strikes by the union-backed retail workers group OUR Walmart, including a several-day walkout last month during which some 100 workers traveled to Arkansas for protests pegged to the company’s hometown shareholder convention. The retail workers’ campaign now faces perhaps its greatest challenge to date: alleged retaliatory discipline against sixty worker-activists since the June strike, including the firing of nineteen strikers. 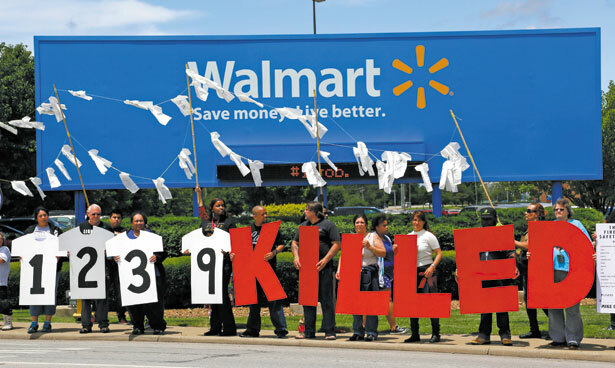 (Walmart denies singling out strikers.) While OUR Walmart held a rally (not a strike) against the alleged retaliation earlier this month in Los Angeles, the group’s main response has been a series of protests targeting members of Walmart’s board, including Yahoo CEO Marissa Mayer—an apparent effort to make Walmart’s alleged crimes a liability for the high-profile tech titan. OUR Walmart actions this week are targeting Williams Capital Group CEO Christopher Williams and Community Foundation of San Francisco Chair Aída Álvarez, who also sit on Walmart’s board. Update (8:45 AM EST Thursday): In a Wednesday e-mail to The Nation, Olivet Corporate Secretary Peter Lin acknowledged "a stop-work event" which he said involves "a small number" of employees and "a larger number of outsiders with their own agenda." "We respect their right to strike just as well as we do the right of other employees who chose not to strike," wrote Lin. He said that retaliation allegations "are false," that "The working conditions are nothing like those claimed or reported by some to the media," and that "Any issues that arise as a result of OSHA's inspection will be addressed accordingly." Walmart did not respond to a Wednesday request for comment on the strike. Workers are increasingly looking for ways to organize outside of traditional unions, but who should fund these alt-labor groups?